In case you didn't know, this site has a resident cocktail expert and his name is Kyle Jones. Kyle and his family live in Nassau, Bahamas, where he works for a boutique wine and spirit importer, distributor, and retailer called Young's Fine Wine. Kyle wears many hats at Young's Fine Wine—from designing cocktail menus for local hotels and fine dining restaurants, to curating the wine and signature drink program for the exclusive Kamalame Cay luncheons—he is a well-respected tastemaker on these islands. Today's featured cocktail is extra special. Last fall, the Fever-Tree beverage company published a book titled The Art of Mixing: Simple long drinks & cocktails from the world's leading bars and Kyle' recipe for the Bombay Squall was included. It was such a treat to be able to photograph Kyle's cocktail alongside the book and ask him a few questions about the ingredients he chose to use, the basics of making infusions, and some of the cocktail industry work he's most proud of. Jones recommends sipping on this spicy concoction while pulling up a "seat at a bar with a view of the ocean." Wherever you are, I hope you enjoy this recipe—it's absolutely delicious. tLBCC: Can you tell us about the Fever Tree cocktail book and how your recipe came to be included? Kyle Jones: The Fever-Tree cocktail book is fantastic. It is full of recipes created by some of the top cocktail minds around the world (...so I’m not sure why they asked me, haha). Obviously, each includes a Fever-Tree tonic in some form but there are so many interesting options that you will find yourself wanting to try them all. I received an email one day from the Fever-Tree Caribbean rep asking me to be involved in the project. Contributing was a no brainer for me. I was very proud to have been published—especially in this kind of creative venture with such a reputable company. tLBCC: How would you describe the flavor profile of the Bombay Squall? 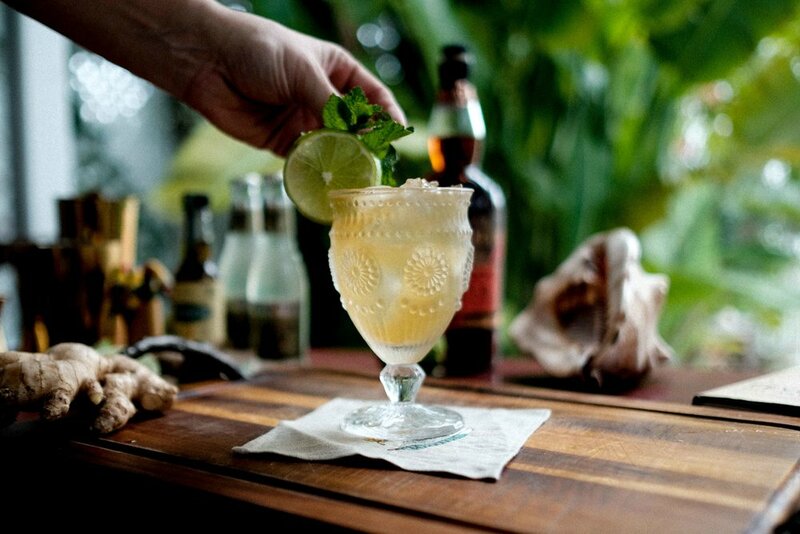 Kyle Jones: This is a simple twist on one of my favorite drinks, the Dark and Stormy. 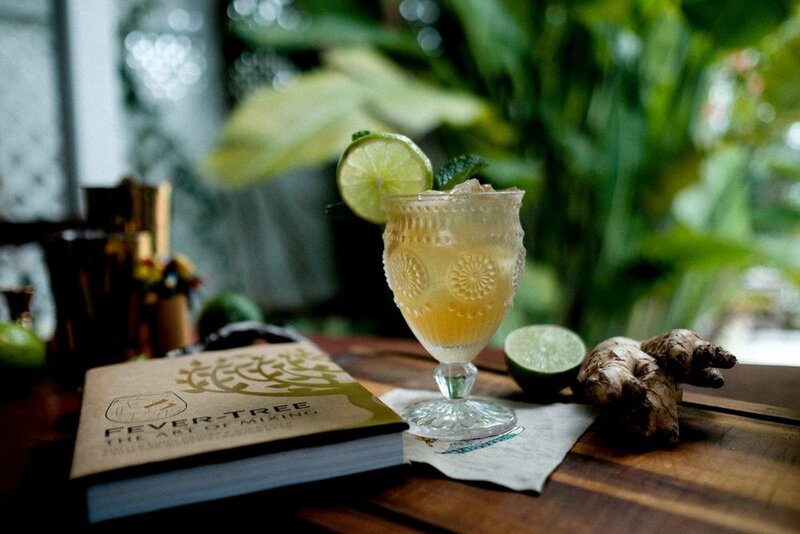 Since there are only a few ingredients in this cocktail so much depends on the type of rum and ginger beer you choose. For the Bombay Squall, in particular, Fever-Tree is most certainly the best way to go—or for any cocktail for that matter! 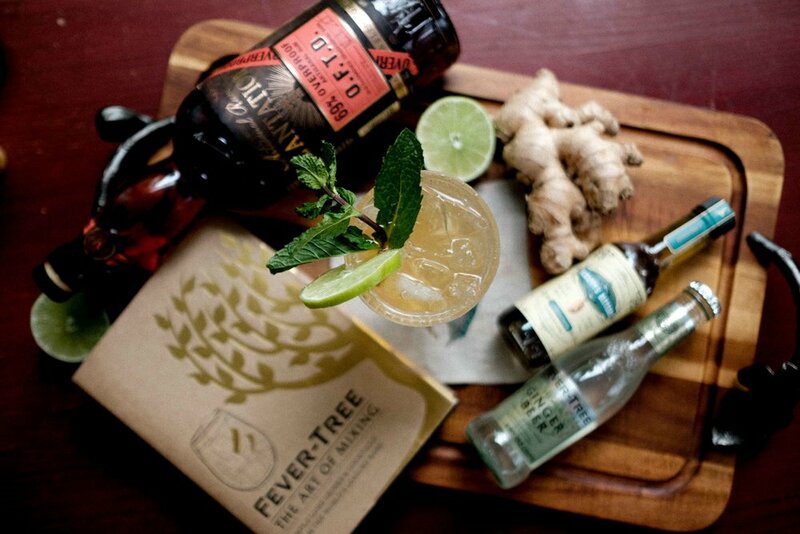 Fever Tree Ginger Beer has a natural ginger taste with a crisp and spicy finish. Adding the Scrappy’s Cardamom Bitters gives this a beautiful extra layer of flavor and spice. Add rum, bitters, and lime juice to a highball glass and fill with ice. Top with Fever-Tree Ginger Beer. Pass the cocktail from glass to shaker once (do not shake because shaking will cause the bubbles to go flat). Garnish with a lime wheel and a sprig of mint. 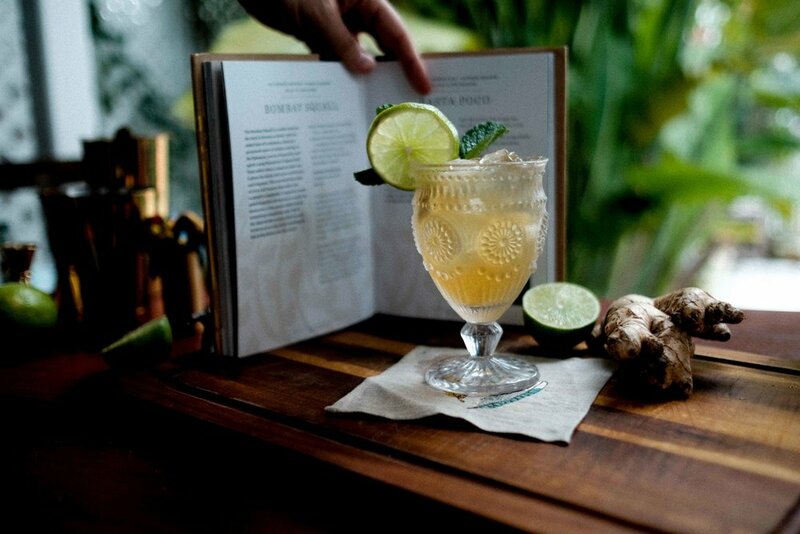 tLBCC: In the book, the Bombay Squall recipe calls for cardamom-infused rum. Do you have any tips or tricks for folks who'd like to try their hand at infusing spirits with spices, teas, coffee's, etc? How would you recommend getting started? Kyle Jones: The cardamom infused rum recipe works well if you don't have access to Scrappy’s Cardamom Bitters. You don’t want to use both as the cardamom would overpower the drink. As for infusing a spirit, it’s one of the easiest things to do and can completely transform a drink. The recipe for each ingredient will vary based on the strength of the herb/fruit/etc. For instance, star anise can be a very powerful flavor when added to a spirit so you either want to use only a limited amount when infusing or do it for much less time than you might for infusing an herb like thyme. It’s best to store an infusion in a cool dark place for your desired amount of time. One of my favorite things to do is on-the-spot tea infusions. I use a small French press, put a little Earl Grey tea or jasmine tea in the bottom, and add gin. The longer you infuse the more the spirit will take the flavor of your ingredient, but for something like tea a couple minutes will get me the desired affect easily. tLBCC: It's not unusual to see Fever Tree beverages on the menu at specialty coffee shops and their tonic is often paired with espresso for the increasingly popular menu item the 'espresso tonic'. At Young's Fine Wine you import Fever Tree to the Bahamas along with your boutique wines and spirits. What do you think makes the Fever Tree ginger beer and tonics stand out—in other words, why do they appeal to specialty shops or why are they worthy of import? Kyle Jones: Yeah, I think it’s great to see specialty coffee shops embracing tonic as they have. For a long time there was a hole in the market where the only tonic that you could buy was Schweppes or Canada Dry. Brands like Fever-Tree capitalized on a growing cocktail industry where bartenders were searching for quality outside of just the spirits they were using. I like Fever-Tree’s motto too, “if 3/4 of your cocktail is the mixer, make sure you use the best”, it makes complete sense. I think with Fever-Tree though they just use fresh ingredients and it shows in the taste and quality of their product. Not only that, but they have some great tonic options that include the classic Indian Tonic as well as a Mediterranean Tonic, Elderflower Tonic, Aromatic Tonic, even a Clementine and Cinnamon limited edition Tonic. As for importing Fever-Tree, it was an easy decision. This island didn’t have any premium mixers on it and with the addition of some upscale hotels and resorts in recent years they were happy to see it here. Places like The Rosewood and SLS are a natural fit for Fever-Tree. tLBCC: You do a lot of cocktail consulting and menu design for local restaurants and bars, can you tell us a little bit about a recent project you've worked on that you are particularly proud of? Kyle Jones: Hmm, that’s a tough one. I really do put a lot of thought and work into each menu I create—after all, it is my reputation for each drink on the menu. I think the first menu I created here in the Bahamas—for Mahogany House—I was pretty proud of. That was about 5 years ago and it is still a solid fixture in their restaurant. Not only that, Mahogany House is one of the best places to eat in the Bahamas so being able to design a great cocktail list to accompany their food menu was fun for sure.